What Meetup Triggers and Actions are Supported? New Event - Triggered when a new event is listed within the desginated search criteria within groups you organize. New Event Comment - Triggers whenever someone makes a new comment on an event. New Venue - Triggers whenever a meetup is held at a new venue. New Group Photo - Triggers when a new photo is uploaded to the group. New Group Member - Triggers when someone joins the group. New RSVP - Triggers whenever a new RSVP is made for a meet up. New Event From Search - Triggers when a new event is found from search criteria. Upload Photo - Uploads a photo to an album. Next we will ask you to give your new Account a name or label, which is just a handy name for you to recognize within Zapier. Then, click the continue to redirect to meetup.com. 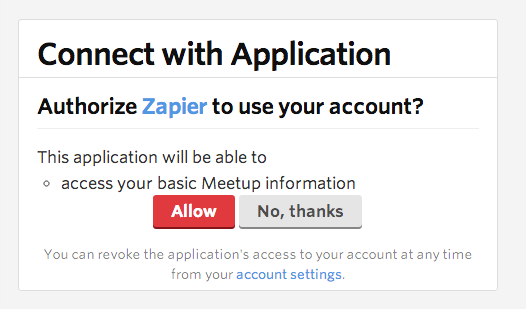 On the Meetup page, you should see prompt asking you to authorize Zapier. Click authorize to continue. If you everything went well Zapier will show you your account is working and you can continue setting up your Zap! Meetup hides user's email addresses from being sent over the API, so you will not get this field by default. One option is to add a custom field to the sign up form and include a field for email address there. You'll be able to use that field to map to subsequent actions.